The death toll from the two earthquakes that rocked northwestern Pakistan yesterday rose to 21 today, according to news reports. The earthquakes also injured 13, five of them seriously, and damaged more than 200 houses, all in the Northwestern Frontier Province, daily Dawn said. Banned metal strings, falls from rooftops, scuffles and road accidents at a traditional kite flying festival in Lahore killed four people and injured 80 others, the police said today. At least 90 persons were killed and 75 others injured today in two major fire accidents in China at a busy shopping mall in northeast China’s Jilin province and a temple, the police said. The first fire occurred at a four-storey building at 11.20 a.m. (8.50 a.m. IST) on the second floor of Jilin city’s Zhongbai shopping mall where many people were busy with their weekend shopping. At least 26 persons, including four children, were killed and 110 injured when the glass and concrete roof of a water entertainment park here crashed down on hundreds of people last night. 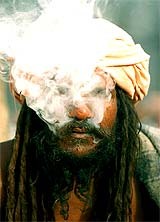 An Indian sadhu smokes marijuana at Pashupati temple in Kathmanadu on Sunday. Thousands of devotees visit Nepal during the Shivaratri festival which falls on February 18. Why single out A. Q. Khan? Proliferation of nuclear technology by Pakistani scientists and its consequences for that nation are the subject of endless debate in the entire media. This is natural. The case of selling nuclear secrets to Iran, North Korea and Libya is well established not only by the reports of the Western intelligence but also by the public admission of the top scientists in full public glare. The death toll from the two earthquakes that rocked northwestern Pakistan yesterday rose to 21 today, according to news reports. The earthquakes also injured 13, five of them seriously, and damaged more than 200 houses, all in the Northwestern Frontier Province (NWFP), daily Dawn said. The quakes measuring 5.7 and 5.6 on the Richter scale were also felt in some parts of the central Punjab province including the capital Islamabad. The valleys of Kaghan, Knosh, Alayee and Bhogarmang of Mansehra district, 80 km north of Islamabad were the worst hit where at least 17 people died. Police officials said 13 people including two children were killed when a bus they were travelling in was pushed into a ravine by a landslide set off by the jolts in the Alayee valley. Another eight were killed in different parts of NWFP province when their houses collapsed, the report said. 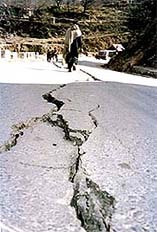 The earthquakes also damaged a government hospital and roads in the Kawai area, according to The News. Occurring within 90 minutes of each other, the epicentre of the tremors was located 200 km northeast of Peshawar city. Among the dead was a six-year-old girl whose throat was slit by a metal kite string stretching across a street where she was walking with her mother last night, said Athar Khan, a police spokesman in the city. Two men were killed when they were hit by cars while trying to catch stray kites in two separate accidents late yesterday, Khan said. A teenage boy fell to his death from the roof of his home while flying a kite. At least 90 persons were killed and 75 others injured today in two major fire accidents in China at a busy shopping mall in northeast China’s Jilin province and a temple, the police said. The first fire occurred at a four-storey building at 11.20 a.m. (8.50 a.m. IST) on the second floor of Jilin city’s Zhongbai shopping mall where many people were busy with their weekend shopping. Of the 71 injured persons, 13 were in a critical condition, while 23 among the dead were females, doctors said. So far 120 persons were rescued with rescue workers and fire-fighters still searching for survivors, Xinhua news agency reported. 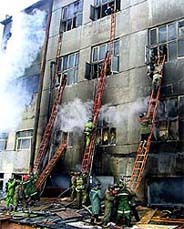 About 260 firefighters and 60 fire engines put out the fire after over six hours, state media reported from Jilin. A special investigation team headed by Sun Huashan, deputy director of the state administration of work safety, also rushed from Beijing to the fire scene. At least 23 bodies have been pulled out from the rubble, four of them of children, Emergency Situations Minister Sergei Shoigu was quoted by Itar Tass news agency as saying. One man succumbed to his injuries in hospital. There were at least 800 persons in the park at the time of the incident. At least 362 of them were in its pool area when the roof of the pool collapsed yesterday, Emergency Situations Ministry spokesman Vicktor Beltov said. Local television channels put the toll at 26 and the number of injured was 110. Initial reports sparked fears of another strike by alleged Chechen rebels but the authorities have ruled out terrorism and blamed faulty construction or heavy snow piled up on the roof as being responsible for the incident at the Transvaal park in south-west Moscow. On the eve of the three-day talks between officials of the two countries to work out modalities for a composite dialogue, Pakistan today said it approached the parleys with a “positive frame of mind” and hoped that India would reciprocate in the same manner. Sounding optimistic about the talks beginning tomorrow, Pakistan Foreign Minister Khurishid Mehmood Kasuri said he hoped that both sides would stick to the spirit of the joint statement issued on January 6 after a meeting between Prime Minister Atal Bihari Vajpayee and President Pervez Musharraf here. Proliferation of nuclear technology by Pakistani scientists and its consequences for that nation are the subject of endless debate in the entire media. This is natural. The case of selling nuclear secrets to Iran, North Korea and Libya is well established not only by the reports of the Western intelligence but also by the public admission of the top scientists in full public glare. People in Pakistan have been fed on the invincibility of the nuclear capability of their country and heroic job done by the scientists and the political and military leadership are struck by the turn of events. The hotly debated point is that why A.Q. Khan has been singled out not by the Pakistan’s President Pervez Musharraf, but American President Bush also. Many newspapers looked at the whole issue of nuclearisation, the monopoly and role of big powers and how should third world countries react to it? The questions have been raised in Dawn, Daily Times, News International, Nation and Urdu papers, Jang and Nawa-e-Waqt besides many public figures. Nation in its comment advised that the government would do well to ponder over the implications of President Bush’s remarks regarding proliferation made in his address at the Fort McNair National Defence University. According to him proliferation poses direct threat to the security of the USA as groups of terrorists could acquire weapons of mass destruction to create even greater devastation than the one effected on 9/11. The black market in nuclear designs and components is a source from which the terrorists can gain access to lethal weapons.” Nation found these warnings serious which needed to be debated. MOSCOW: The Soviet Union’s 10-year invasion of Afghanistan was a mistake, former Soviet leader Mikhail Gorbachev acknowledged on the eve of the 15th anniversary of Soviet withdrawal. “An attempt to force an extraneous social model on a country that has deep traditions of its own is always doomed to failure,” Gorbachev said.